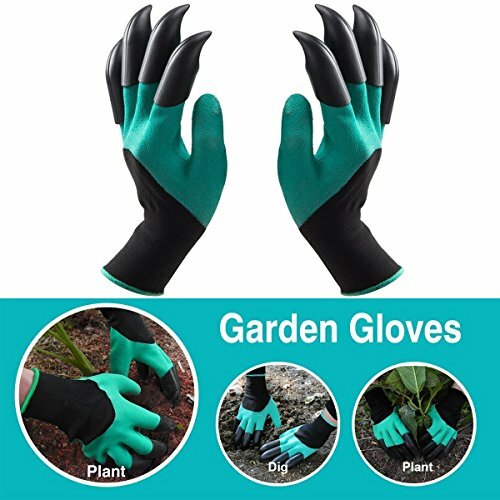 QUICK & EASY TO PLANT - 4 ABS plastic claws on LEFT & RIGHT GLOVE. (Value of 2 pairs in one!) All 8 claws have been attached with an environmentally friendly adhesive. Easy solution for digging, planting, and raking without hand tools. Durable construction prevents broken fingernails and bruised fingertips. A set of tools in each hand. Perfect for keeping up with your garden work! PROTECTIVE & DURABLE MATERIAL - Innovative polyester material with a natural rubber latex coating provides a comfortable layer of protection against thorns & punctures. This light and waterproof polyester keeps your hands clean & dry. Even after hours of work! DIGGERZ LLC genie gloves keep your hands clean & dry without compromising protection! ONE SIZE FITS MOST - High quality materials allow a forming fit for gardeners of any age. Fits most women, men, & kids. Stylish and protective design that kids can safely use. Fits like a glove for the whole family! A GREAT GARDENING GIFT FOR ANYONE - Universal size and protection makes gifting easy! This has been a hit for gifts for Mom! Also a perfect gift idea for Dad and any kind of gardening gift set. Manufacturer: QIN. BLUE SHIELD PROTECTION LTD. Publisher: QIN. BLUE SHIELD PROTECTION LTD. Studio: QIN. BLUE SHIELD PROTECTION LTD. If you have any questions about this product by DIGGERZ LLC, contact us by completing and submitting the form below. If you are looking for a specif part number, please include it with your message.